Given that our target race for the year, Ötillö, involves 10km of swimming, Izzy and I decided to enter the USwim 5km race at Salford Quays. This is my boyfriend Andy’s local spot, so it was quite convenient! Compared to several other swim races we’ve looked at, the entry fee was reasonable as well. So on Saturday morning we made our way over by train and tram, moving from a state of calm: ‘oh, are we really racing today?’ to nerves: ‘argh, we really are racing today!’. Sign on was as simple as possible. We were crossed off the list, handed a hat and had our number written on our hand. All we had to do was make a trip to the shopping centre to visit the toilets, eat our BeetIt bars and get changed! A BeetIt shot before bed and a bar an hour before racing! Although it wasn’t gloriously sunny, it still felt warmer than it had at home, and without the biting wind. The water was reputedly about 12 degrees, which we were happy with. After giving some interested people the lowdown on swimrun and our special wetsuits, I attached my gps running watch to my goggle strap to see how far we really swam and was ready to go. It was a mass start with swimmers doing 1.5km, 3.8km and 5km races altogether, but wearing different coloured hats. Ours were gold. I started at the edge of the group but soon realised I was missing drafting opportunities. We had 5 laps to do. Just over halfway through the first one, I could see a group in front and a big gap to me. I wondered whether our race positions were already decided! Round and round we went. 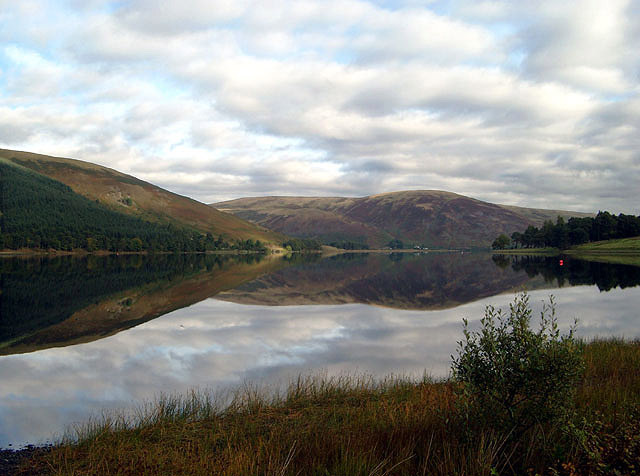 After the murk of Threipmuir, the water was very clear. We could see fish and, when the sun peeked out, the water sparkled beneath us. Halfway into lap 3, I caught up with two other 5k racers. I started drafting the one who was going in the straightest line, with the intention of overtaking shortly, but he sped up! I just stayed on his heels as best I could. He wasn’t bad at sighting apart from one mad veering off course. He turned out to be a great motivator and I needed it. The beeps in my ear from my watch were telling me that each lap was a little over 1km. At the end of 3 laps I was beginning to feel the effort and thinking we were getting beyond the point of my normal training swims. We were soon catching people finishing the other races on their short laps, which was fun. Just before the end of lap 4, as my calf threatened to cramp, someone in a gold hat came charging past. Argh! I’d been lapped! But I was weary and had problems with trapped wind in my stomach. This sometimes happens when I swim hard and I haven’t worked out why. I managed to force out a few burps for temporary relief. Start of lap 5 and my new companion sped up! It was all I could do to hang on. I told myself to keep trying because it was a race and therefore supposed to be hard. I’m not used to this feeling when swimming. We caught a guy at the far end who tried to go with us but couldn’t. We also overtook a few others, but it was difficult to tell if they were on the same lap and fading, or whether we were lapping them. 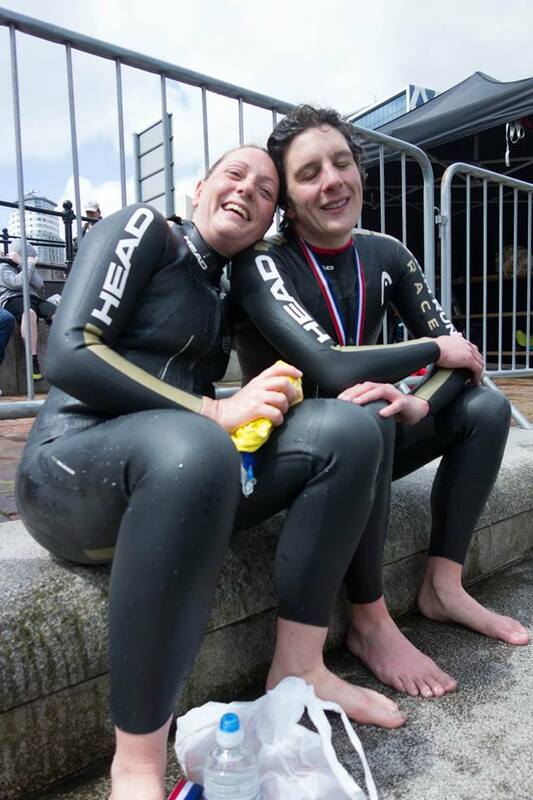 Despite a straightforward rectangular course in the quays, you could still be some lateral distance from other swimmers so it was hard to judge what was going on. I thought the final leg would never end. In a moment of inattention, my buddy got away from me and I couldn’t swim back to him. I was feeling a bit weak but refused to give up. As we approached the finish, there was a ramp under the water. As it got closer, I couldn’t look at the floor beneath me without feeling totally disorientated. But I couldn’t swim with my eyes shut either! Finally I was there. I shouted out my number and held up my hand before crawling out. Wow, I was definitely ‘fuzzy wuzzy’ and had to have a sit down. Andy had done the 3.8k race and luckily had finished about 5 or 6 minutes in front of me and could take photos! He seemed surprised to see me so soon … I was surprised Izzy wasn’t in first, but just 4 minutes later, there she was, looking in a slightly better state than me. Although I’d been thinking our swimrun session with paddles on Thursday night hadn’t been ideal preparation for a race, it turned out she’d also done a hard set that morning! I think we’ll be well matched when we race as a team. I got cold quite quickly so we changed into more clothes than would seem necessary for what was turning into a very pleasant day. Izzy and I both tried out our flapjack bars from the ChiaCharge sample pack. Mmm, very tasty! They were soft, sweet, oaty and we both savoured the salty flakes. It was also good to know those little chia seeds were giving us an extra post-workout protein boost! I was pleased I had another with me for my planned run the next day. Prize giving happened quickly. At first I was announced as 3rd, but there had been a mix up. I was demoted to 4th! It’s not the first time that this has happened to me, but it was all realised and resolved instantly, so I was not distraught. The first three girls finished within 4 minutes of each other and I was another 8 back, so I didn’t feel hard done by. I think Izzy and I were 4th and 5th girls, but we’re waiting for the results to check and see how we did overall. I measured that we swam 5.3km and my time was 1h27 mins. I’m pleased with that anyway as it’s been well over 10 years since I swam so far. It was time to go and find food and cake! Is this what the pros do? 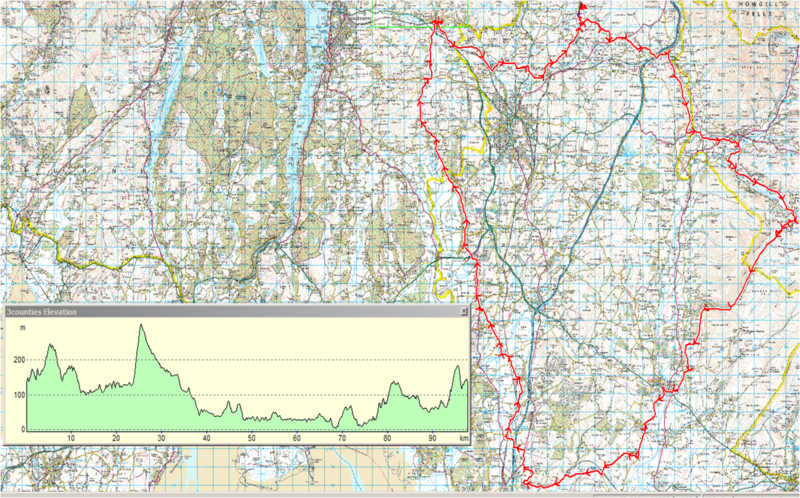 The next day I ran 26.8km in the hills, making it an almost ‘Borås swimrun weekend’. In two weeks time I’ll have to do the same again, but a little bit further, in one go and with even more hills! In the meantime, we’ve still got some kit stuff to sort out and test. Time is running out! 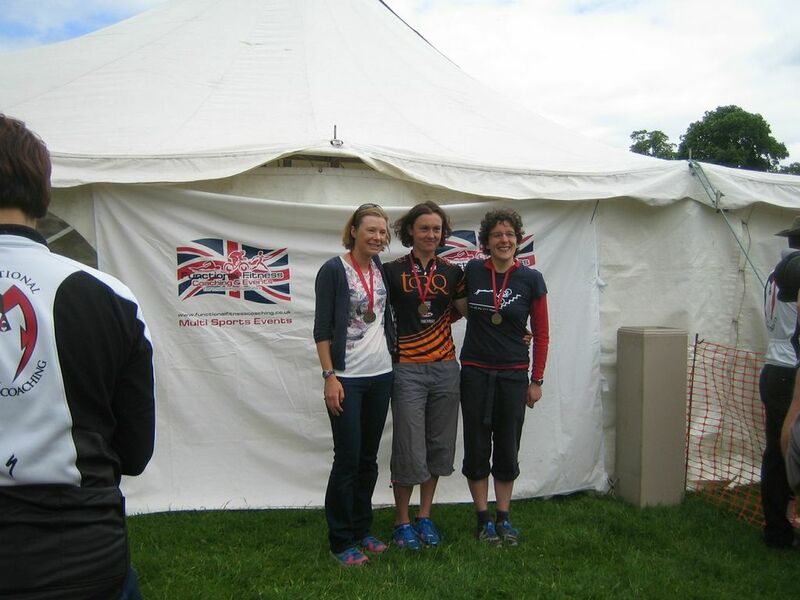 I was very remiss last month, as I never got round to writing about the Bowhill long duathlon! It was the last in the series and lived up to all expectations with fun trails, water and lots of mud. This time I went down with Andy, who took lots of photographs, but only after he had ‘tested out’ the run course and only just made it back in time for us racers to start! I will let the pictures tell the story of a very fun day. Me on the bike with slight wardrobe malfunction – tights are on inside out! As far as the results go, I had a fantastic bike ride and was leading for 12 minutes on the run! Things went a bit downhill from there, as my run was slower than last year and I was overtaken by both Jo and Caroline. I still came 3rd though – another bottle of beer for Andy, and I was 2nd in the series – another bottle of beer for Glen! He also got lucky with some homemade chocolate marshmallow icing biscuity things I rustled up the night before. Easy to use space for up to 6 bikes! I am not used to this luxury. Fast forward a few weeks and it was time for a mini mountain bike adventure. Andreas is a friend of mine who is training to become a ride leader and wanted to get some experience. He had chosen a route and came to me for some company. I willingly obliged and brought along Marie and Elizabeth, who were equally up for some wild fun. The only downside was my sleep deprivation in the week leading up to it – with two early morning swims, a trip to London and a 5.30am pick up on Saturday morning! We drove up to Taynuilt and had half an hour to wait for the train to Tyndrum, where we would start the ride back again. 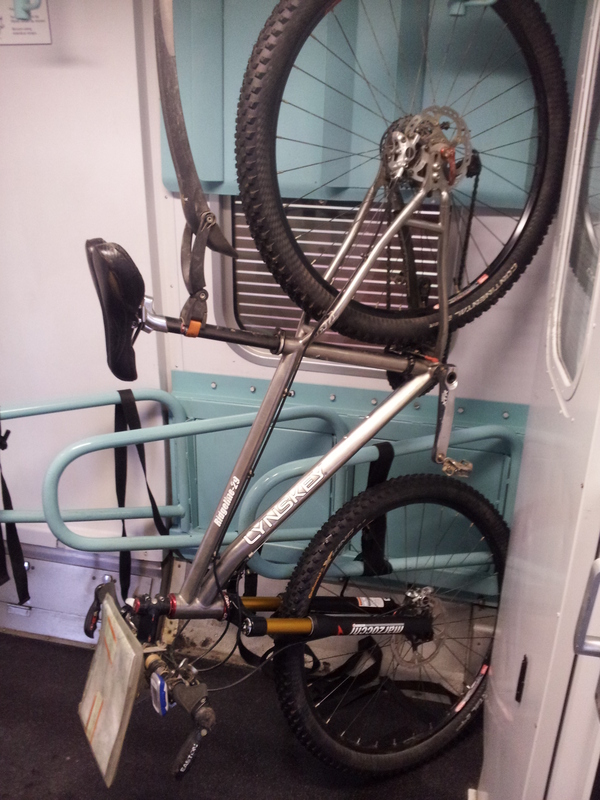 I was most impressed with the bike carriage provision – easy space to get into for 6 bikes! Whilst Marie and Andreas jostled for position and rode on ahead, I was more than happy to ride further back with Elizabeth chatting about holiday plans, races and life in general. That is, when we could hear each other over the roar of the wind in our ears. This was another excuse to try out some new portables – on the menu were polenta squares (tasty but turned out a bit squishy), French toast cake (very good, especially with added sultanas), potato and ginger rice balls (surprisingly OK) and my favourite from last time, sweet potato cakes. 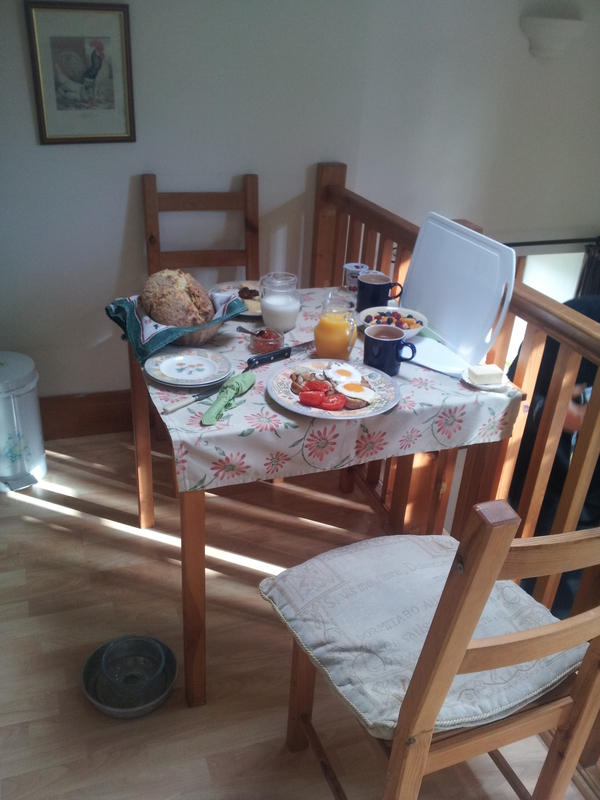 I also had a few Quorn mini eggs, just for good measure. Shame I didn’t eat more of them before I nearly bonked an hour in, or wanted to stop, lie down and sleep halfway through. All good Itera training, I told myself. I’d love to go back and enjoy the fantastic scenery and amazing waterfalls another time – though waterfalls are always better when it’s raining! I enjoyed the random bog walk / bridge hunt, which was the only part of the day where we really had to do any navigation. On the second ‘looking for the path’ occasion, right near the end, I asked someone how to get to another bridge, even though the others said that was cheating! This little bridge was harder to ride over than it looks! 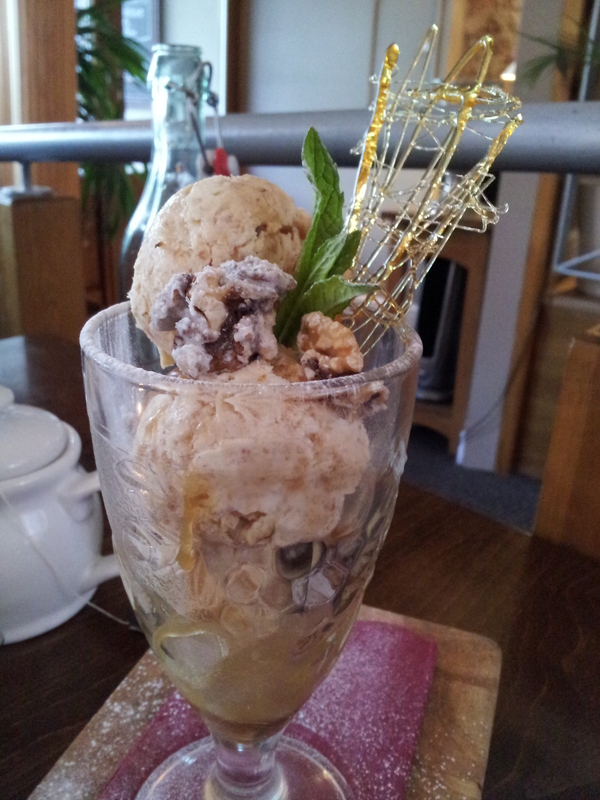 We ended the day in the Real Food Café as we drove back through Tyndrum. I must have been feeling funny, as in addition to my usual soup choice, I found myself ordering a plate of chips and cheese! I am not a big chip fan, preferring spicy potato wedges instead. I found a good spot for these though. Full tummy, warm clean clothes, not too far home and I was definitely ready for my bed! Finally, this weekend I was in the Lake District for Lucy’s wedding party. She had chosen somewhere close enough to Kendal for us to get to without a car, but not so close we could stagger back there at the end! So I found a gem of a B&B just a mile along a country lane, complete with a genial host and an upstairs lounge with word burning stove and balcony. On Saturday we went for a run to Staveley, to try out Wilf’s cafe. We were supposed to walk back, but ran out of time and had to run instead – suddenly we had covered 26km! Perfect preparation for a night of ceilidh dancing. I’m sort of running, at least! On Sunday we took advantage of the sunny weather and went for a 97km road bike ride taking in three counties (Cumbria, North Yorkshire and Lancashire) and a huge variety of landscapes. Andy praised me for finding something approaching a flattish route when we were staying in the Lake District, though the one long climb to get into Barbondale did nearly finish him off. Although I almost always talk about MTB adventures, this does prove I sometimes ride a road bike 🙂 . I’ve got half an eye on the Coniston Old Man triathlon coming up in June. This is the only triathlon I’ve entered so far this year, and I want to give it a decent go! Club triathlon handicap trophy held aloft = weight training! 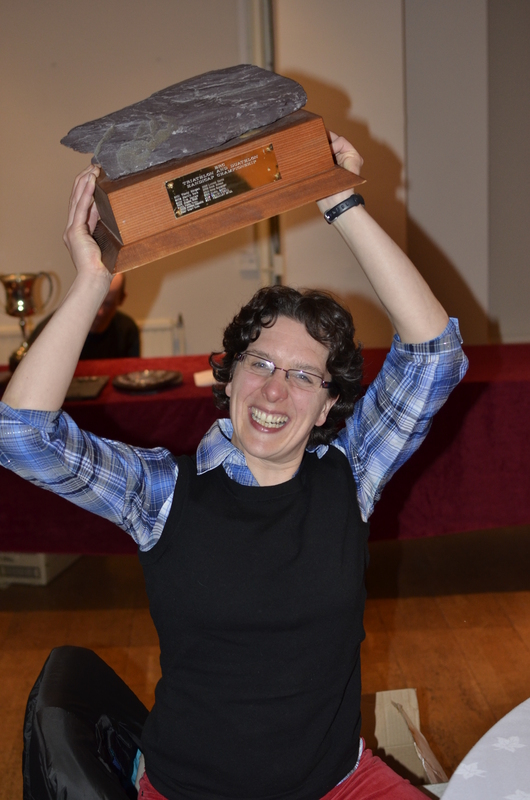 Next report will be from the final Open 5 of the series, where I’ll be back in the Lake District again! Why? For great organisation, reasonable entry fee, free camping and entry to the fancy house and gardens, equitable treatment of the women’s race, fast course, cash prizes, post-race cool-off paddling pool. What more could you ask for?! Why? You get to swim to an island with no roads, race round an interesting off-road course with captive spectators and run over a hill with stunning views. I had made this race one of my two target races for the year, but felt I under-performed compared to my capability. I learnt from it though! Aberfeldy Middle Distance Tri. My second target race of the year. Despite being ill, I gave it all I could. Couldn’t have been prouder of my Scottish Championship bronze! 220 triathlon magazine article published. Shropshire Open 5. The series final racing with Lucy. We had been gradually improving and this was where it all came together in a fantastic performance. Well, I have done a half marathon before, but it was very many years ago! I entered this one at short notice and surprised myself at how much I enjoyed it and how well I did. I even squeaked into the top 10 of a proper running race with a large field! 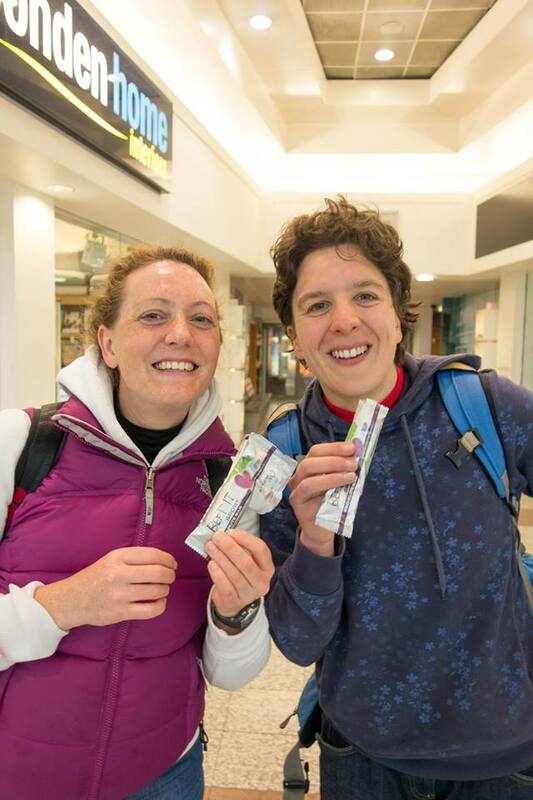 I really like purple Haglöfs carry-alls, snugly bodywarmers, Tricentre vouchers, buffs and beer for Andy and excuses to spend cash prizes at the women’s specific triathlon store tent. I am not so keen on free entry to a race in 5 days time, 236km from where I live. Hey! They’re all following me! 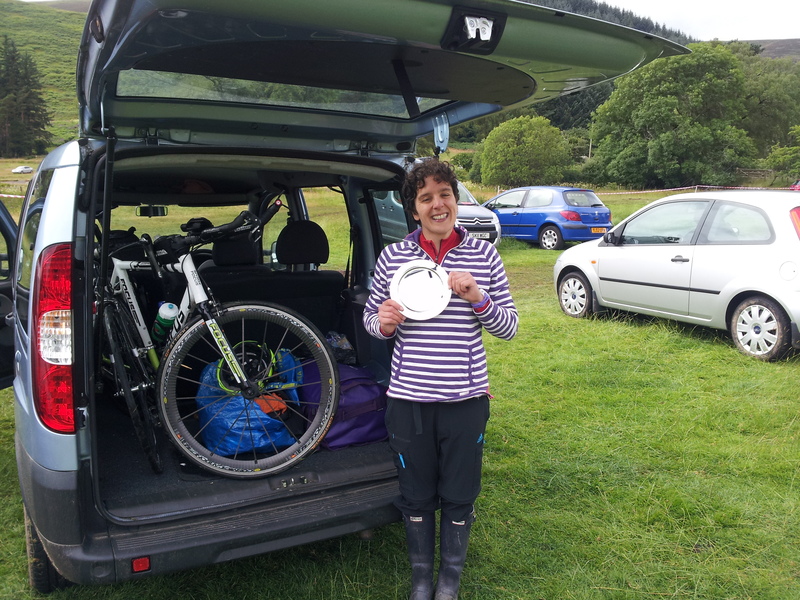 Car with both bikes and rain cover, me with welly boots and silver plate! Ah, kayaking, a stage that mostly went well somehow! You can read this article in the March edition of 220 Triathlon! Having fun biking on one of the easier trails! Chilling in the cool-down pool! Series leaders for the first time this year! My return to racing after a ‘rest’ period! Before the Open 5 … Where have I been for a month?! Well, after the Snowman race, I was due a break and really needed it. I was a bit tired of racing and spent the week at my dad’s relaxing. OK, so I included a couple of long bike rides and a ‘romp’ up and down a mountain in that time, but I also had nothing else to do except cook, eat, sleep and laze around! That was fun. The next couple of weeks I rode my bike to work and did the minimum of running to keep things ticking over. That included a couple of 5km Parkruns – still chasing that elusive 20 minute barrier though! On Thursday 31st October, I marked the end of recovering by heading out for a local Halloween special. 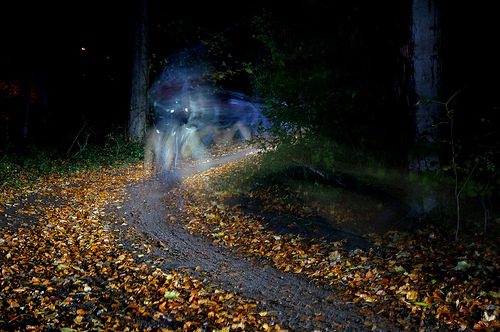 A cyclocross race in the dark in fancy dress! It was a whole lot of fun and I had an excellent battle with my friend Elizabeth – though she got the better of me in the end and accused me of cornering like a roadie … oops. She came an excellent 2nd. I was a bit frustrated to come 4th. I was beaten by 3rd place by less time (18 secs) than I gave away at the start (74 secs) by not being assertive and waiting near the front of the mass of riders. Hey hum, it wasn’t a serious race and it got my legs working at a speed I’m not used to! It also forced me to abandon my fear of slidy mud riding, at least temporarily. I wanted to ride over the day before, but the weather was rubbish. I settled for an afternoon and evening catching up with jobs before heading out for a lift from the bypass the next morning. Halfway through town, a car with bikes on the back came past, pulled over and offered me a lift. Many thanks to Anna and Chris! Because I had been at home the night before, I didn’t really feel in race mode. But once I arrived and got the map, I was soon right back into it! We struggled to decide what we might do for the bike, though I knew from experience that it was a good idea to study the contours in the forest very carefully. At the start we got the control values and set off confidently straight up the hill on the run. We had a nice circuit ready for this. At one point we considered crossing a pathless felled area. I pondered that ‘Lucy would make us go that way’, but we decided not to. That is, until a few hundred metres later an easier opening appeared and we took off! Caroline was good at finding a route through the tricky bits and confidently led us back down hill next to a stream. At a sheepfold we debated whether to go up again before we went back … going back was the right decision as we arrived in transition after almost exactly 2h. The last couple of km had been tough for me – nothing new there then! Onto the bikes and we were straight back up the same hill we had started on the run. We nearly made it before we spun out and then were soon on a singletrack leading to the top of Minch Moor. I love that hill! Steady gradient, rocky and a fabulous power climb with huge panoramic views at the top. We didn’t stop long to admire them though, as we headed for a muddy out and back on the Southern Upland Way. Apparently at the control we bumped into my friend Andy, but I totally ignored him … I mean … failed to notice him! On the other hand, we unwittingly gave him a ‘good tip’ as we confidently stated out loud that it was definitely not worth going out further to the next control along. Tales back at race HQ confirmed it! The ride had plenty of technical challenge. As well as the rocky climb, we now had a muddy ascent, where you had to search for firmer ground, feeling whether your wheels would grip and constantly adjusting position and scanning ahead. Next we were screeching downhill again on the man-made trail, and I was working hard to keep up as Caroline demonstrated her superior descending prowess! The points allocation for the bike leg made it hard to come up with an ‘elegant’ route. We had to do a few out and backs. Later, back at home, I spotted a potentially better route, but I am not sure we would have had time to execute it anyway. As the race drew to a close we did one last long out and back. I wanted to collect at least two, maybe three controls out there, but the clock was ticking and we were slowing. I faced one of those difficult decisions as we stood at the track / road junction and Caroline said ‘you decide’. I was feeling good, but I could see she was not, and we had 9km into a headwind to go. Drafting. Not far to go now! I decided to just turn back and faced the final technical challenge! We didn’t have a tow line, but the headwind was strong. We decided Caroline would draft me, so I had to find the right pace and then use my internal power meter to keep a consistent effort back to the finish. 😀 Another good decision for the day, we got in with 3 minutes to spare. How unlike me! At prizegiving we found out we had won our category and come 7th overall. So despite the pain, we had achieved a respectable score and it was safe to ask Caroline if she had enjoyed the experience :-). She said she did, and we certainly appreciated the lovely Haglofs gilet we both got as a prize. I don’t know if I will persuade Caroline out again now that she really knows what she’s letting herself in for, but in any case we had a great time out in the autumn sunshine! 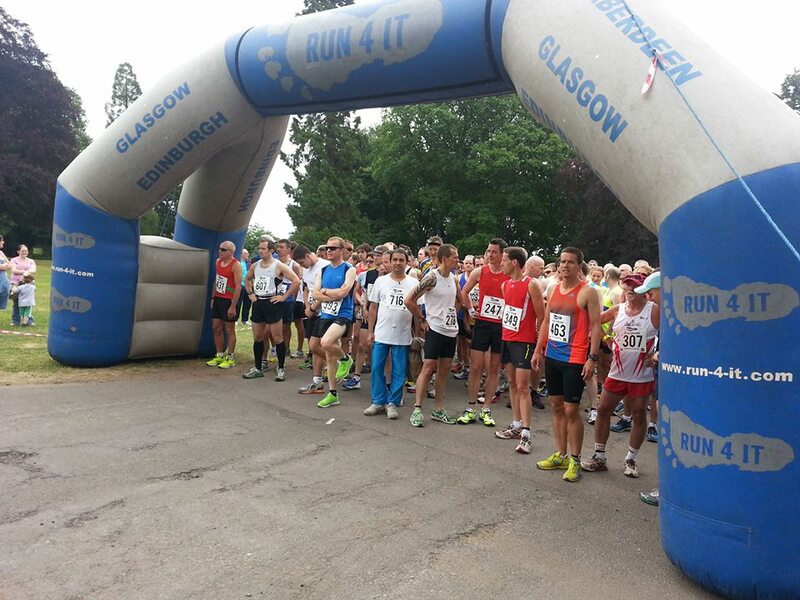 Many thanks to Open Adventure for putting on the race and to James Kirby for the Open 5 photos. Saturday had seen the ‘Durty Tri’ – the off road version of our race at the same location, which I had forgone for more specific training. My friend Marie was competing but had all her kit stolen the day before. Somehow, she managed to get a whole set of everything together (my contribution was the loan of a wetsuit), raced and came second. Another friend of mine, Elizabeth, won – so with mates 1, 2 on the podium on Saturday, I felt anticipation at trying to join them on Sunday! Although Saturday’s weather forecast looked pretty good, Sunday was dire. Heavy rain all day until 4pm?! At least it wasn’t going to be windy. Andy was doing this race as well. I had persuaded him to do it instead of a more local race, informing him that it would be fun (true), there were lots of people from the club going (true), and the course was really flat and fast (erm …). Looking at the route profiles and descriptions on Saturday night, I found it wasn’t so flat on the bike – especially with roadworks meaning we had to do two laps of the first bit, which was up and down a moderately sized hill and back! The run was definitely flat, so that was something. My good friend Chris picked us up in his “popemobile”, aka a really practical car for going to races in. Both bikes fit in upright without any need to deconstruct, and the back door opens up like a roof for getting changed under in the rain. At the race HQ, welly boots were a definite advantage. I practised my smug look as I waded right through all the muddy puddles between the car park (a field) and transition (a different bit of field). I wasn’t so smug at forgetting about the possible midge factor. After the usual nervousness of getting ready, it was time for briefing. I was waving my arms around and practising dry land swimming, whilst everyone else stood stationary. Straight into the water, and some people were oohing and ahhing about how cold it was. I was thinking it was like a warm bath! There wasn’t much time for more warm up before the hooter went and we were off. 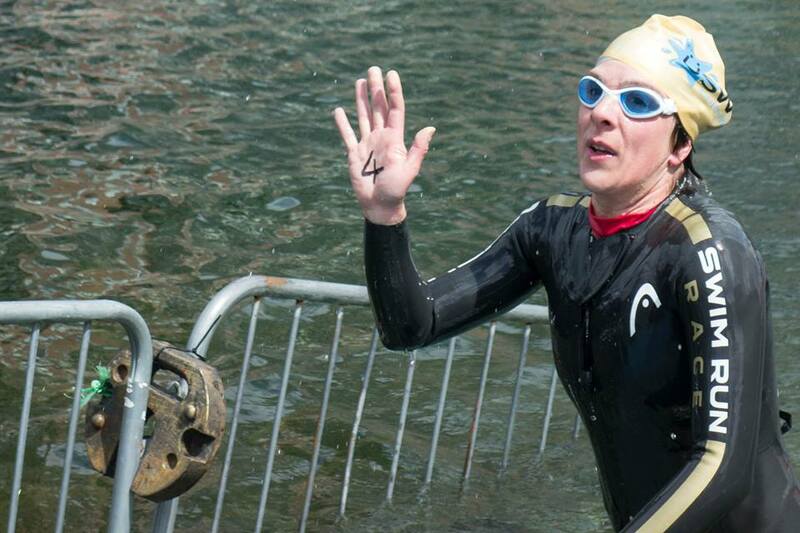 I was determined to put in a decent race effort on the swim. I realised a few races back that I’ve just been cruising the swim and losing valuable time. I’ve also been making more of an effort to attend 5:30am swimming sessions with faster people than me, and didn’t want all that hard work / torture to go to waste! One of the GREAT things about this race from my point of view, was that all the women and super-vet males went in wave 1, with everyone else about 10 minutes behind in wave 2. This meant I was near the front of the pack for the swim. I was doing some great drafting as we rounded the first buoy. I tapped someone’s feet and they sped up, but not for long and I soon struck out away from my little group. There were 3 or 4 people in front but I couldn’t bridge the gap and swam the remaining 1.5 laps on my own. 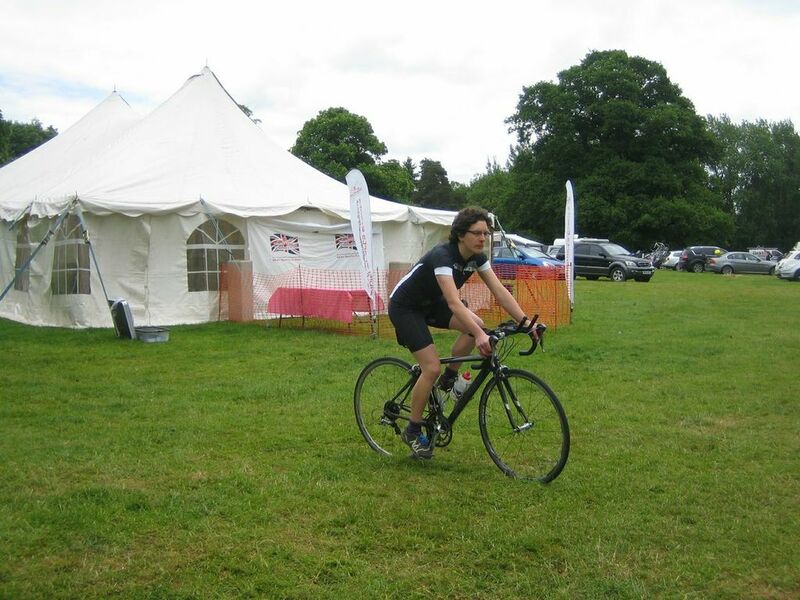 I was delighted with my time of 24:25, which included the run up to transition. I was in and out quickly (11th fastest overall), even with putting socks on. After over-taking one or two people on the road, Paul shouted to me that I was second ‘girlie’ at the turn :D. The one up at the front looked very fast though. Since we turned around three times, I could check where everyone was. I was confident of a top 3 finish. Because we were set off first, we also had clear road up at the front. A few of the supervets passed me, but not many. I didn’t have to worry about drafting, or getting caught up with middle-of-the-pack men who like overtaking and then slowing down. Really, did I mention how great having our own wave was?! Coming back into transition a car was coming the other way up the rough drive. I hesitated. They stopped for me to pass just next to a big puddle. I went into it with a BANG! Yep, immediate burst tube and flat tyre as the water was hiding a big pothole! Luckily it was right in front of the dismount line, so I jumped off and bumped my way back in. This transition was more clumsy. Although my average bike speed was disappointingly slow (I need to sort that out) I did feel a bit weebly wobbly standing on one foot trying to get my running shoe on. So I must have worked moderately hard. Eventually I was on my way again. 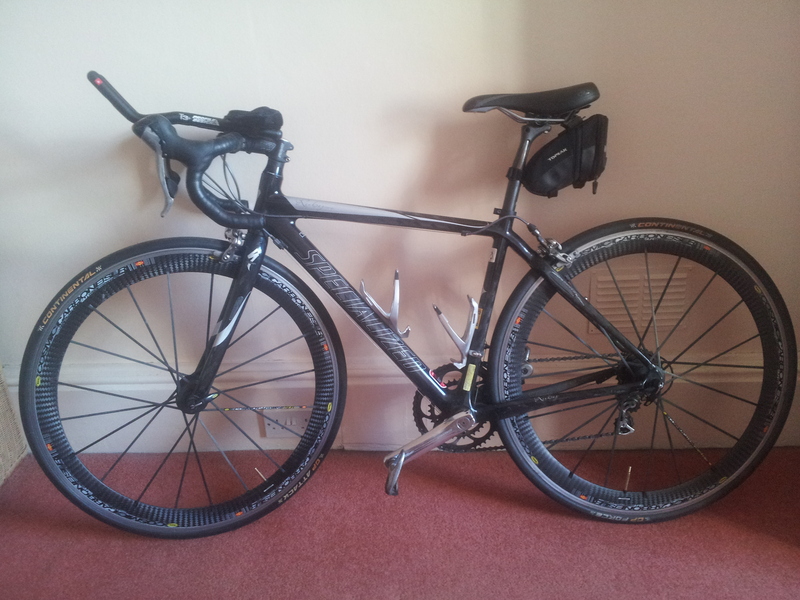 Andy’s lent me his race wheels for the next two races. Do wheels which double the value of the bike make you go double the speed? Looking at the results, I was 4:40 minutes down on the leading lady at this point. I was close to 8 minutes clear of the next person though – I didn’t know I’d got that far away! What I hadn’t realised about the run was how technical it would be underfoot. Although it was flat, we were soon off camber on narrow paths, sometimes grassy and sometimes stony and uneven. It also twisted this way and that through the trees. I had been really up for doing this run fast after my half marathon success the week before. But the first thing I was thinking was how heavy my legs were feeling. Then after a couple of kilometres my calf started hurting. Uh-oh! This was the same thing I’d had at the end of the half marathon, but I had thought nothing of it since then. I carried on and it didn’t worsen, but never went away. A couple of guys overtook and pulled away. Then there was an open gate through a field and what looked like a trodden path across the grass. 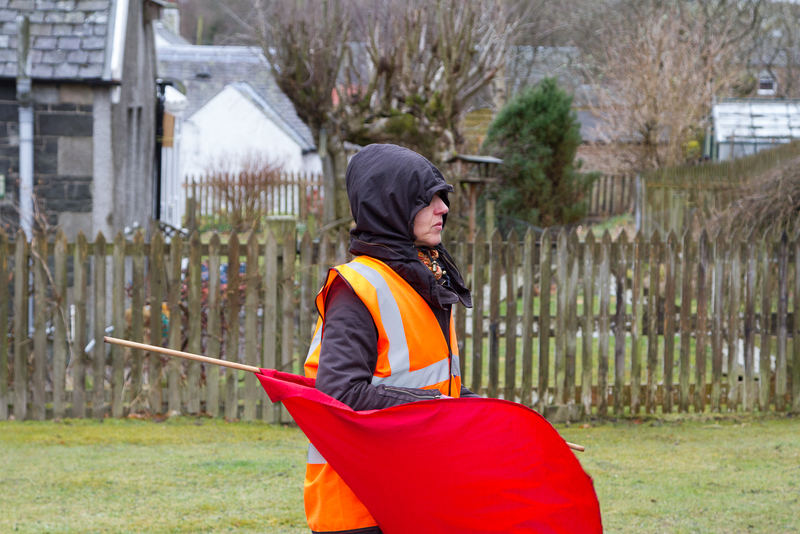 But we had been following red and white tape markers. I hesitated. There was a stile to the left of the gate. It had tape all over it. There was an orange arrow pointing across it and away from the field. And there was a Southern Upland Way sign (we were told at briefing the route stayed on this path the whole way). I leapt (slid) over the stile and was in woods – still worried, but then I saw more tape and knew I was right. 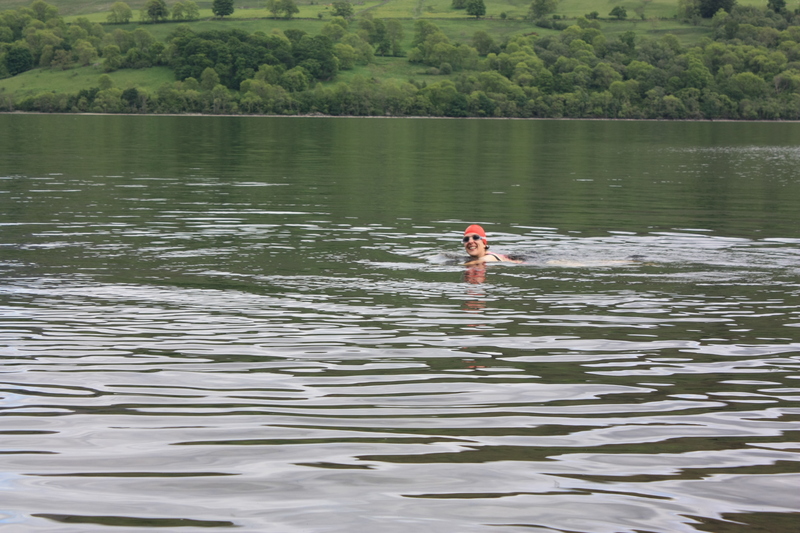 My adventure racing skills extend beyond reading a map and choosing a route – I’m also good at arrow-spotting of all kinds :-D.
People cheered loudly from a boat out on the loch, which was fun! As the path joined a fire road, the guys who’d overtaken appeared – they knew they’d gone the wrong way but hadn’t lost a lot of time. To my surprise, the lead lady was also just in front. She had also gone the wrong way, but had perhaps spent longer getting back on track. I slowly, slowly started closing and just made contact as we turned at the 5km point. I paused for a cup of water and to eat a gel and she opened the gap back up. All the way back along the fire road, I was making no ground. Andy (boyfriend) and Tom (clubmate) both passed going the other way and yelled at me to catch up. It was encouraging, but secretly inside I was feeling tired and heavy and my calf was hurting. I couldn’t up the pace. However, Tom told me later that I looked the more comfortable. We got back onto the rougher, uneven section. I suddenly noticed that the girl in front was less at ease on this section and I was doing better on the little downhill slopes. I decided to capitalise on my off-road experience and go for it. I ran past and held my pace. I was concerned I had seized an opportunity, but too soon. We still had a way to run. I didn’t dare look back until the next stile, but when I did, she had vanished. I couldn’t believe it. I just needed to keep this up until the finish. Another stile, another look. I was on my own, and the finish was in sight about 800m ahead of me! Wow. 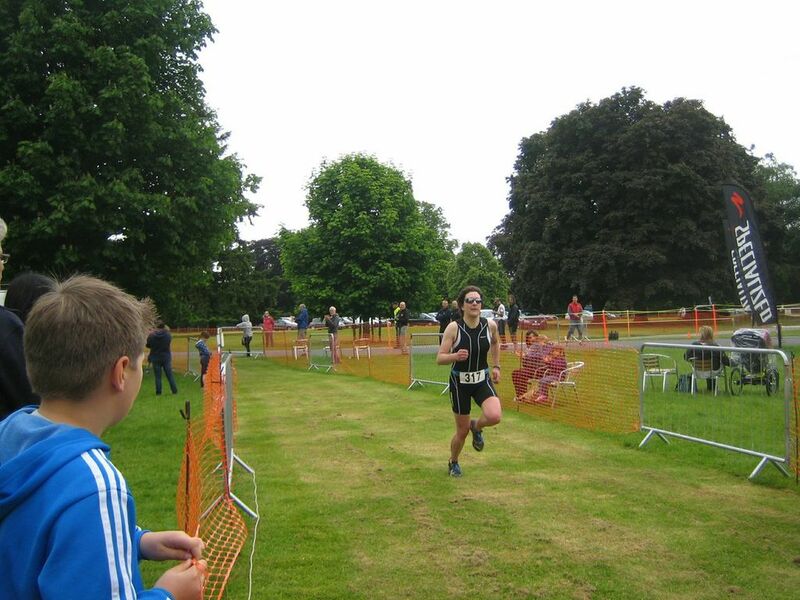 I made a final effort, Heili (erstwhile support of Glen and I at the Bowhill duathlons) cheered, and I crossed the line. After the Slateman finishing order debacle, I wouldn’t believe I had won until someone who knew for sure confirmed it. Anne was on finish line duty, taking our timing dibbers off us. “You’re first lady” she said. Woweee!!! Much excitement, and I loved climbing on the very high finish podium to collect my silver plate. My first Scottish race win of the year! Even Andy had forgiven me for the hills and my course mis-descriptions as he had fun. Full results here. The only tarnish to the day was my calf – which immediately seized up after I stopped. The last few days have been a cycle of it getting sore when I sit down, easing off when I walk and generally being a pain. At my pre-booked sports massage with Kirsty, she confirmed it was fatigued, very stiff, but not torn or knotted. 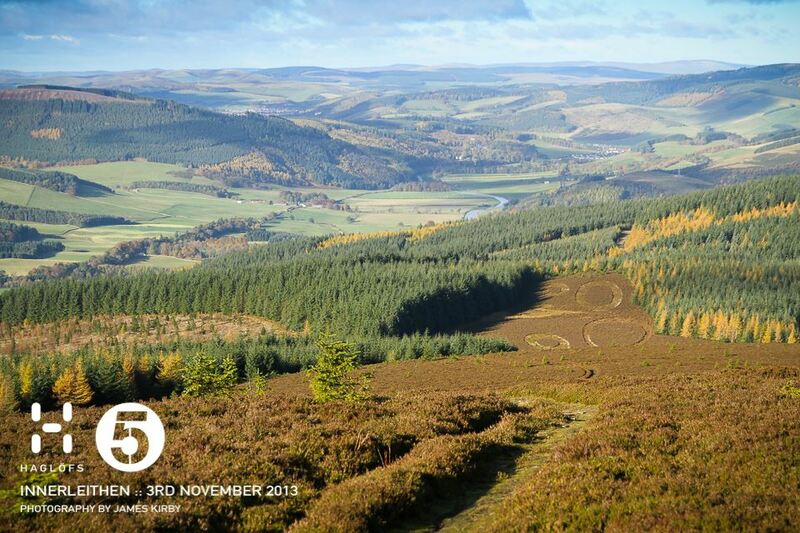 Next race only a week later and Aberfeldy (the important one) two weeks after that. She said I would risk injury if I did the weekend, but it was my call …. And the call (after consultation with my coach and Andy and a full consideration of many factors) is that I will race the Scottish Standard distance champs near Aberdeen. This race wasn’t on the plan and was a late decision a few weeks ago. The competition is likely to be stiff and I may have to alter my usual approach to account for my calf. So I have set my expectations accordingly. The non-stop summer racing continues … but gingerly! July and are August are busy racing months for me this year! So you get two races for the price of one in this report :-). 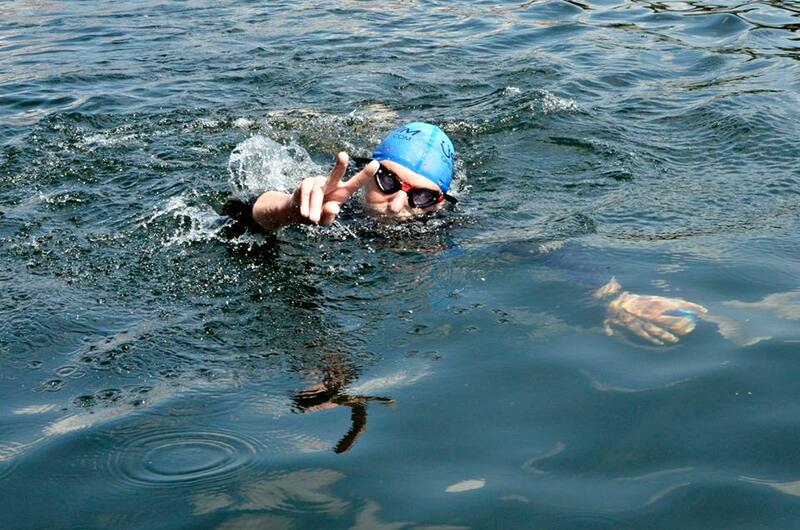 A few weekends ago my boyfriend was swimming a 10km open water race. Yes, that’s 10km swimming. I don’t know what had taken over his brain when he decided this was a good idea. After having had to drag him into the water literally kicking and screaming, in just a couple of years he has turned into a swimming fanatic. Nothing wrong with that, but even I thought 10km was mad. Anyway, he needed a supporter and Uswim were running a 1500m race starting at the same time. So I entered that one on the basis that I could swim, get out and be ready at the feed station when Andy first needed me. It was a bit stressful getting to the start because it was HOT. And I was desperate for the toilet. And there were queues. And Andy was anxious. But it all sorted itself out and soon I was in Dock 9 at Salford Quays ready to go. I was on holiday after the 2 day adventure race and there was no way there was any room for a wetsuit in the packing, so I was ‘doing it skin’. It was so hot I was quite glad! The hooter went and I practiced drafting and swimming hard and sighting. In 27 minutes I was finished (think the course might have been a bit long). 8th female, though also only beaten by 5 men! The results didn’t say who was in a wetsuit or not (wetsuits make you faster due to extra buoyancy). I threw a T-shirt on and ran round to the floating platform to support Andy. The long course swimmers were doing 10 x 1km laps. For the next 3.5 hours I handed out snacks and drinks and took photos. The bits of sticky iced bun were well received! As was the coconut water. I also took to helping some of the other swimmers and the lap counters on the platform with me. Time passed quite quickly – nipping back for the prize giving for my race and watching the race developing at the sharp end. The leading male almost lapped second and third, who were having a private battle. The leading female only opened a significant gap after about 7 laps. It was great to be cheering and encouraging people. As time went on the locals started getting in the way, jumping off bridges and generally messing around. Andy was the last finisher not to be stopped before the end. A superb 3h57! He didn’t seem to understand why he was tired when he got out and the next day. Strange. He made it. “I’m not tired” … yeah, right. The following week I decided on Tuesday to enter a half marathon on Sunday. It was a bit of a scramble to organise a lift with a club mate and get entered before it sold out, but I was sorted. This race was in preparation for the Aberfeldy middle distance triathlon, where I will have to do a half marathon to finish off. The last time I ran this distance was in 1999, in a race in Germany. Back then I was ‘a runner’, but afterwards I didn’t run for 10 years. I hoped this one wouldn’t have the same effect! I’m just tucked in on the far left about 3 or 4 people back. I got picked up early, we drove over, were practically first to arrive and had ages to get ready. 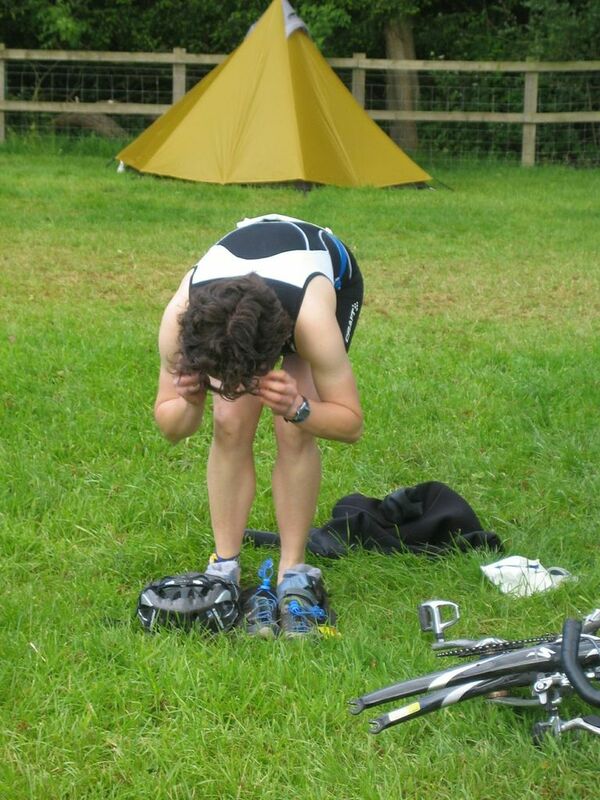 Running races are funny … no kit to get sorted! After several trips to the toilet I was ready and waiting near the front. I had read that it could get congested on the initial hill through some woods and I didn’t want to get held up. The people near me were all discussing their target times. I subconsciously took a step back, but trod on someone’s toe and had to stay where I was! In the end, it was fine. We started, I ran. This was sort of it the whole way round! It’s so long since I have done a running race not requiring the use of a map, or watching footing over uneven ground, or with marked changes in speed. I felt like a metronome as my legs turned over and my arms pumped. At first I wondered if my mile splits might be too quick. But I kept maintaining them – my middle 3 miles were identical speeds, to the second! I drank at drinks stations and ate two gels on the way (keeping hold of my wrappers, unlike some people). Near the start. Testing gel holders on a race belt for the first time. I kept thinking, is this even real? I was having a sort of out of body experience. The mile markers kept ticking by. Suddenly I was going up a hill at miles 9-10. Then a downhill mile, which was inexplicably my slowest. Then the final run along the shore with a tailwind for the first time all race. Actually, I was starting to feel tired now, and my calf was sore. But I was nearly there and kept going. I saw the clock as I approached the line: 1:34 and counting – quick! I can get under 1:35! I also tried to outsprint the two guys near me to much cheering from the marshals and crowds :D. The marshalling and local support had been excellent all the way round. 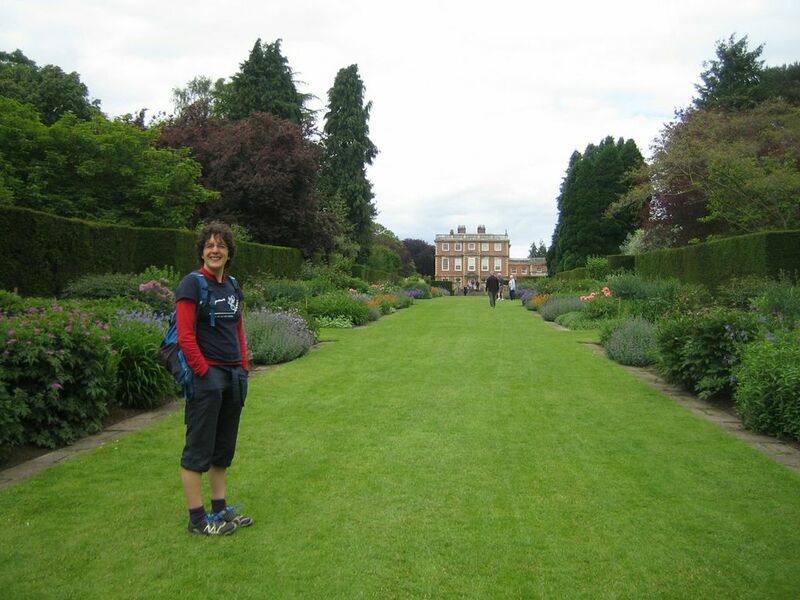 At the end, I took my shoes off and found big blisters on my poor little toes – oops! But the sun had come out (luckily it had been much cooler than recent days in our heatwave) and Peter (who had brought me there) and I relaxed and waited (and waited) for the prize giving. 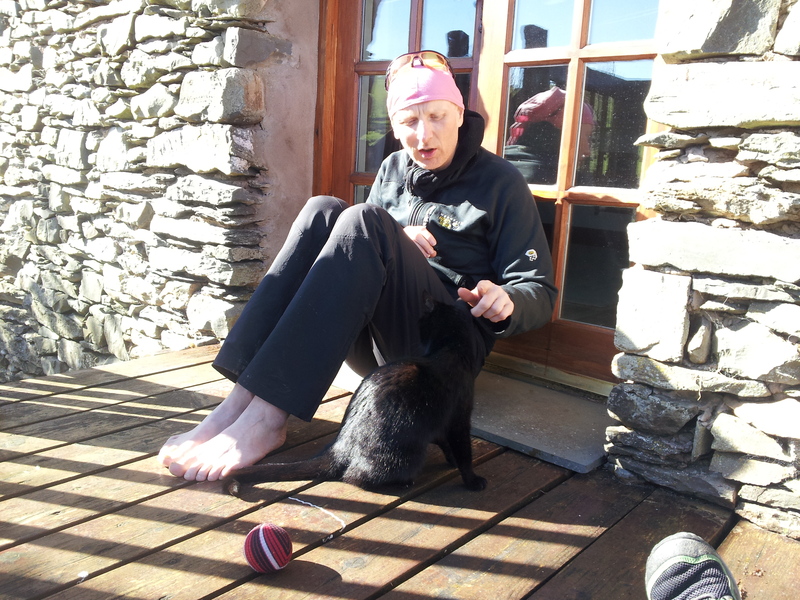 He had come first male supervet in 1h23 – fast! I was 10th female in 1:34:44, which I was delighted with. 5 minutes quicker than 14 years ago! There were 300 female competitors. I was 75th overall out of about 750. Results. Next up: two standard distance triathlons two weekends in a row! Back when I was making my plans for the year, I looked for a race that I could combine with a family visit in the middle of June. The Trident triathlon was chosen. By my standards, this race was as conventional as it gets. Standard distance. Flat. On road. Easy to get to. 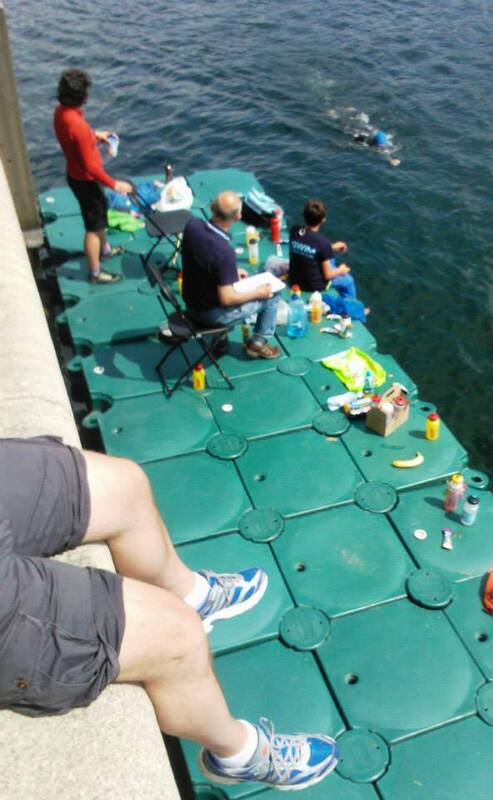 Even the website described it as ‘probably the easiest and fastest triathlon you’ll ever do’. Well, the second part of that claim was certainly true; the first part all depended on how you raced the event! On to dinner in Ripon, which was more of a navigational challenge. Round and round the one way system looking for a car park space and accidentally-on-purpose crossing a ford on the way back! 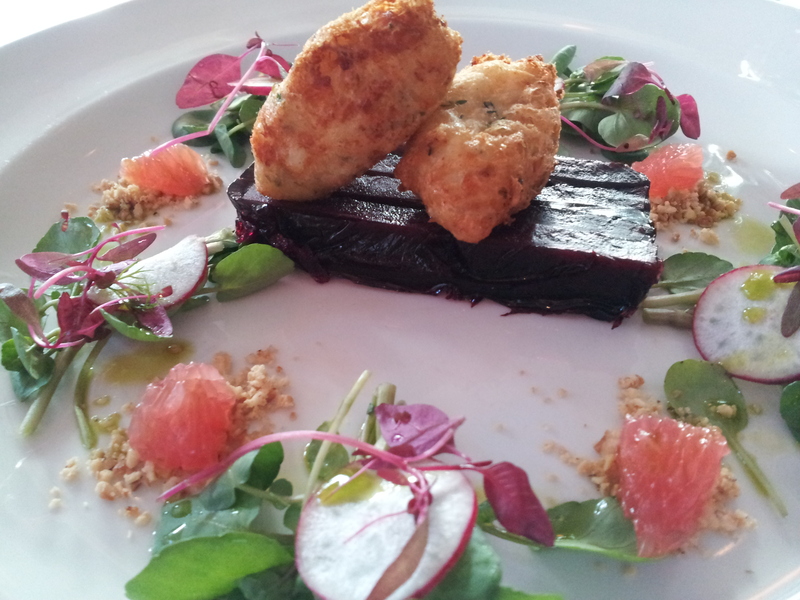 We had a fabulous meal in a restaurant where the chef had actually put some thought and creativity into the vegetarian options. It was worth the slightly higher prices – check out Lockwood’s if you’re in the area. Transition route: from the river up to the house! OK, so it was a pretty cool transition and I made sure to enjoy it now, in case I wasn’t in the mood for enjoying it the next morning :-D.
I slept alright. A woodpecker woke me up in the morning, tapping away in the trees overhead! The race start was super early for me. You had to be ready to go and at the briefing by 7.30. Then there was a trip upriver to the start line. I was feeling a bit sick with unnecessary nerves, but the walk helped calm them. We were greeted by a piper in a kilt … woah, wasn’t expecting that in Ripon! This wasn’t a target race for me, but there were things I wanted to try out and improve on from my last race. I have rated my performance against each objective :-). Plenty of fruit, veg and home cooking consumed, slept more than last time but could do better at sticking to that fictional bedtime! I was one of the first in and started swimming around. It wasn’t too cold at all, but the water was very cloudy and you couldn’t see anyone until you literally swam into them. I even did some little efforts, until I decided to go and find a space near the front. This was the roughtiest, toughtiest swim I have ever done! As soon as the piper piped, people were clawing at my legs, hitting me on the head, swimming right over my body and generally being in very close proximity. I tried to keep to one side of the mass, but we had been instructed to swim in the middle, where there were less overhanging trees and a stronger current. With concentrating on all of this, I admit my effort wasn’t entirely consistent. I did work hard when I remembered though, and even did a little bit of drafting. As usual, I was moving through the group as time went on. After the iconic transition run, I left on my bike as 5th girl, 14th overall. Transition practice in the camping area! I quickly caught a few people, including two girls, on the estate road. We soon sorted ourselves out. I was mostly riding on my own, with the occasional guy powering past. This was the sort of course where a time trial bike would have been a definite advantage over my road bike. I even caught myself thinking a pointy bottle with a straw would be useful. There were no real moments where coming off my bars to get my bottle seemed not to disrupt my speed! I almost ran out of gears with my compact as well, but remembered some good advice for this situation, which is to just spin faster :-). The course had three roundabouts where you turned back on yourself. I could see the gap between me and the next girl in front widening, but I wasn’t making any progress on the ones behind me until perhaps the last 10km. Full of fear about the run, it spurred me on to keep pushing and pushing until the very end. Transition passed uneventfully, I ate my third ever gel and set off on the run with the announcer shouting my name over the loudspeaker. He confirmed that I was currently third placed female. 4th place was only 68 seconds behind! I was now 25th overall. My goal might sound daft. But I was so disappointed in my last race that all the extra run training and intensity work I’ve been doing wasn’t reflected in the result, especially in the second half. I knew I could do better! There were km markers on the course and my splits were giving me a good idea that my pace was OK. Every time I heard footsteps behind I was afraid it was a girl coming to overtake me. On the plus side, not many men were passing anyway. End of lap one and I still hadn’t been caught. My mouth was sticky and dry but I didn’t stop for water. I just kept going and going … my split times were telling me I was holding my pace and from about 7km I actually felt quite good. I was duelling with another guy and we kept each other going. A km from the end, I looked over my shoulder and couldn’t see anyone who might catch up. I was able to run the last part fast, but without panic in my stomach! Into the finish chute, happy to have executed my plan, and most of all to have had a respectable run. The next girl was nearly two minutes behind, and I had actually held my position and time over the second half. My pace was very consistent – in fact, I was 30 seconds faster on lap two, which I think some people would say I could have gone faster?! Years ago, running was my main sport and in the few triathlons I did, was where I excelled. This run gave me encouragement that soon I might race with some confidence again in my ability for the final leg. 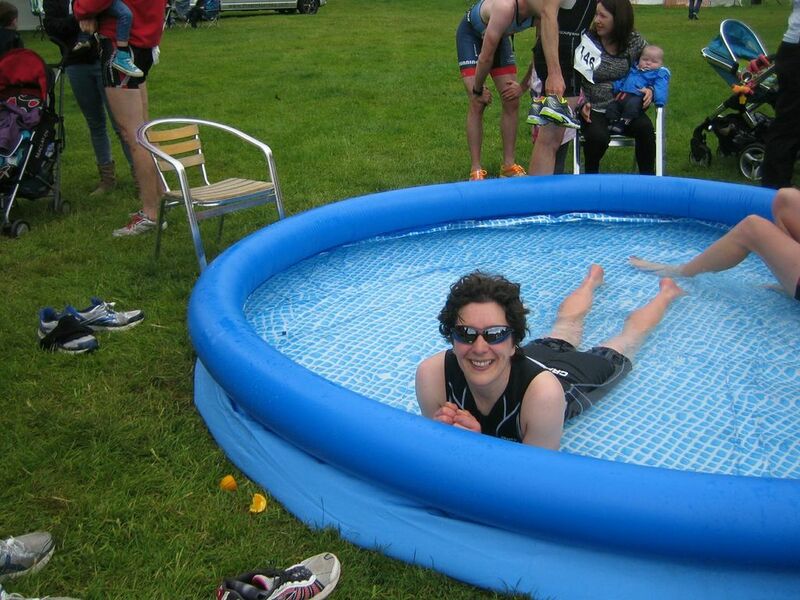 Time to jump in ‘the pool’ to relax and cool down :-D.
The winner was Eleanor Haresign, racing for Torq Tri Team. She was 8 minutes ahead of me. Wow. We had a chat afterwards and she cheerfully told me she’d be racing Aberfeldy this year (my next target race), so I know who I’ll be seeing disappear into the distance then! Emma Wolff was second. I was 27th overall, out of 141. Full results here. 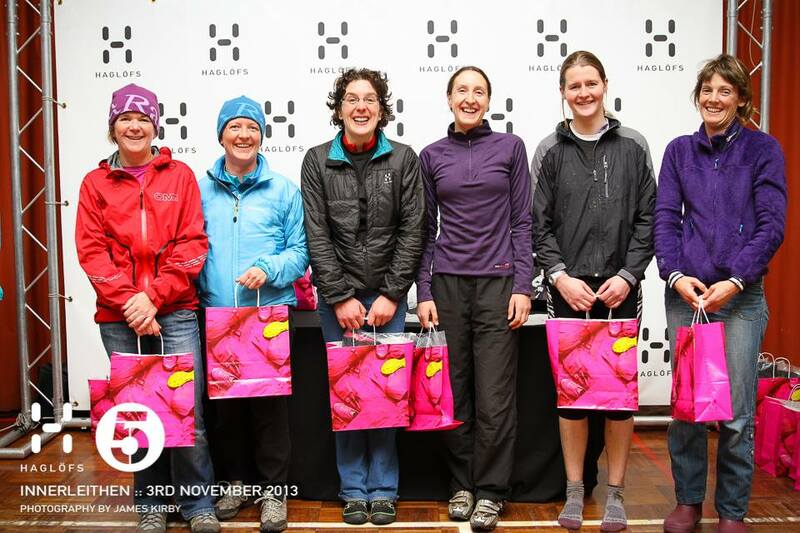 The prizes at this race were very generous. Actual cash in an envelope! Even for third, I got £75 and an inner tube :-). There was also a £10 voucher for a new ladies run, bike and triathlon gear specialist. They had a stand at the event. They’re called ‘The Pink Jersey‘. I promptly went over and spent my voucher and most of the prize money on shorts (which I needed) and a jersey (which I didn’t, but it looked nice). They had a really good selection and the women running it were friendly and helpful. This race is very family friendly. 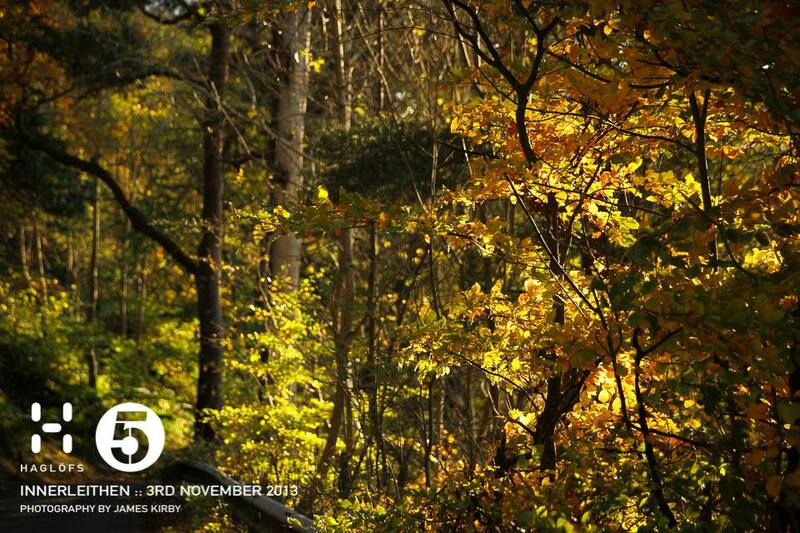 As well as everything else, you get free family entry to the hall and gardens with your race number. The advantage of such an early start is that you’ve finished with plenty of the day left. So my number 1 supporter (mum) and I went and got a good lunch in the café and spent a couple of hours enjoying the extensive gardens. My legs were then ready to give up (so tired, after such a short race! ), so we fortified ourselves with tea and cake before heading home. Oh, I forgot to say, is this the food of champions?! Random extra race = extra blog post! Last Thursday at the club running session, the coach did his usual round up of what was happening at the weekend. He mentioned a 10km race not too far away. I thought this sounded like quite a good idea, and suddenly I was hatching a new training plan for the weekend! 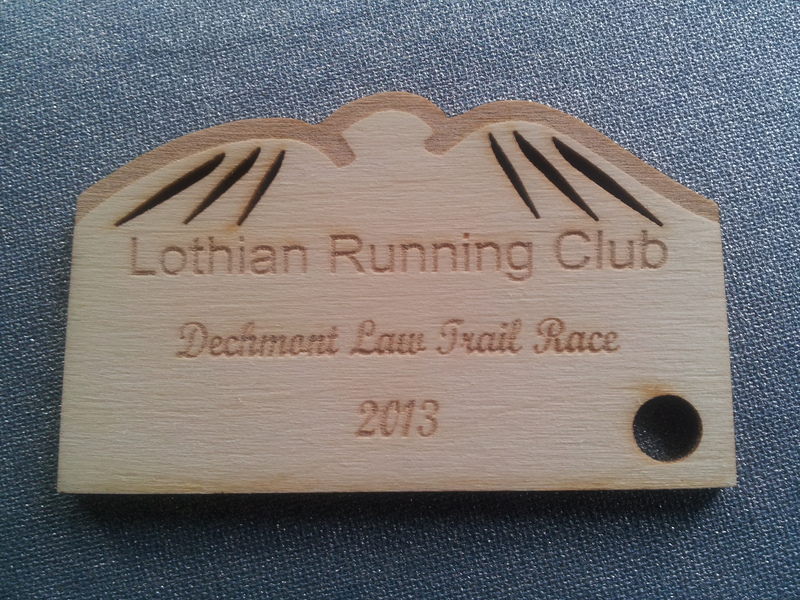 The race was the Dechmont Law 10km trail race. It was out in Livingston, West Lothian, about 30km from where I live. I set my alarm early (for a Sunday morning, anyway) and was soon pedalling out past work and beyond. Apart from a minor navigational hiccough as I hit town (nasty large roads and roundabouts) all went well and I was soon ready to race. Because this was a mini practice for next weekend’s 10km run at the Trident triathlon, I experimented with taking a gel just before the start (my second ever! ), then it was time to line up. There were a lot of people in running club vests! The hooter went off and we all jostled for position as the path began to narrow. I was near a girl who is in my training group, which was encouraging. The course was a complicated set of loops along forest and heathland tracks. I had tried to memorise it but didn’t need to, as the marshalling and signage were faultless! 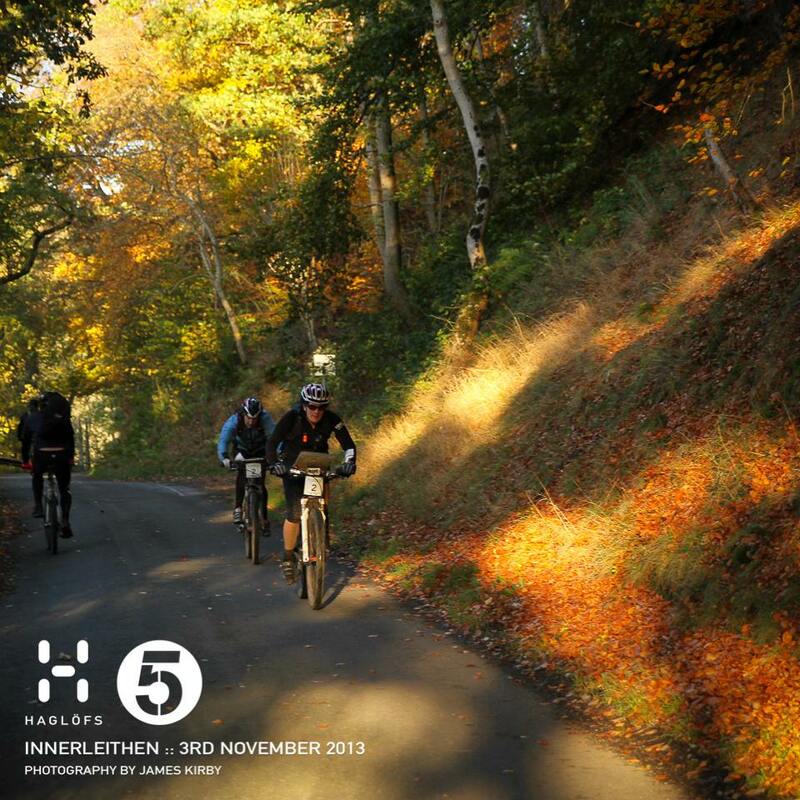 … wait, hang on a minute, this was a 10km race, not some sort of 16 hour epic! Luckily I soon felt a bit better and started vying with one of the girls. A kilometre to go though, and she took off. Part of me thought I should grit my teeth and hang on, the other part just didn’t really mind that much as I was there to have fun and practice what the distance might feel like next week. I finished 6th girl and 36th overall out of 139 – which I was pretty pleased with, even if my time was a little slow. Results here. The course was undulating and you had to be quite careful with your footing in some places, so it was OK. I’d had over a week of hard training as well. A winter spent chasing Lucy downhill in the Open 5s seems to have had some side benefits – I was overtaking plenty of people on the downs, which is most unusual for me. 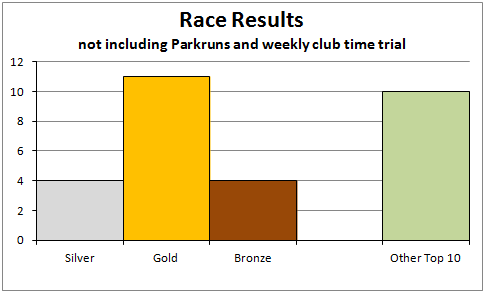 It’s still not my forte compared to fell runners, but seems I’ve become not too bad compared to club runners! At the end I sat in the sun, ate the proffered homemade flapjack and chatted to a few people I knew. Then it was time to pedal home again. 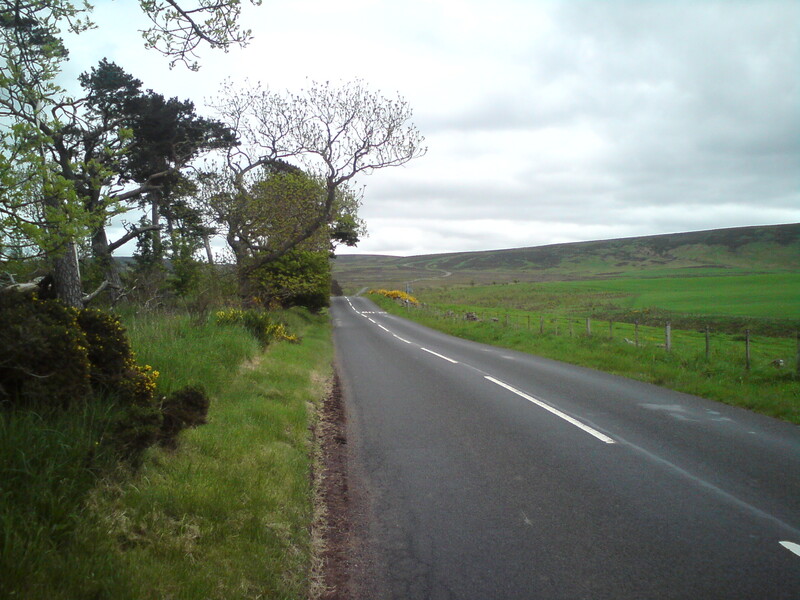 I had a different route set up, with fantastic views of the Pentland Hills and Edinburgh as I zig-zagged along quiet country lanes. I was almost home when my legs threatened to go on strike, but I made it back safely and felt like I’d had a mini adventure! As an aside, James Thurlow, who is race director for Open Adventure, is taking on his own challenge this week. He is doing Wainright’s coast to coast trip of 190 miles on his own two feet to raise money for diabetes research. He has been recently diagnosed with type 1 diabetes himself. This makes the challenge extra hard as he has to manage his blood sugars as he goes, which is tricky. It certainly hasn’t all been plain sailing so far. If you want to donate or find out more, you can do so here. 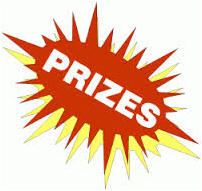 And if you do it before midnight on Wednesday, you can put in a guess for how long it will take him and you might win some kit he has got together as a prize. April’s turning out to be a busy month for me. Somehow I seem to have lined up a race every weekend 5 weeks in a row :-). Of course, not all of these are target races, some of them are training in aid of the bigger goals. The last two are in this category. Because the Tranent triathlon was cancelled I hadn’t even been out on my road bike since the New Year’s Day triathlon. I was also worrying that with a greater focus on running I might be losing speed on my bike. So I entered a hilly 40km road time trial organised by my club. I’ve done this one a few times before. But this year it was also the Scottish Championships. It was only a week after the last Open 5, which was a tough one. I was lucky to have just about recovered in time :D.
The forecast wasn’t great (to put it mildly), so Andy arranged a lift to the start. Meanwhile, I rode over in a raging headwind and intermittent downpours … someone actually stopped and offered me a lift when I was partway there. I declined thinking I felt OK, but just after that I was at an exposed moor section and it all got a lot harder. The Meldons are very scenic in good weather when you’re not racing! On the plus side, I only got to the sign-on about 30 minutes before my start time. I decided I had done plenty of ‘warming up’, got changed and didn’t go back outside in the cold until it was time to go. I ignored the weather and just got on with the job in hand. After the first hill, we turned into a headwind that I knew would last for at least 12km. It was actually longer, as we turned another bend and the wind still bore down on us. 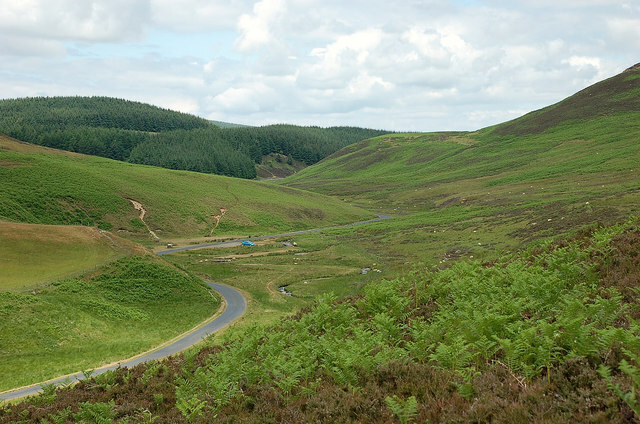 The final turn up and over the Meldons was the exhilarating payback. I have never ridden up the hill so fast! I was set off first and somehow wasn’t caught up, so had the enjoyment of crossing the line first. That was as good as it got … I was almost dead last and only beat someone recovering from being ill and someone coming down with a bug! Mind you, that was out of the people who; signed up, turned up, started and finished. I think there were dropouts at every stage ;-). One of them was Andy – his tale is here, but don’t worry, some good home cooking cheered him up! I cruised home 50 minutes faster than it took me to get there, and it felt good to have had a fast, hard ride. My average speed was fractionally faster than last year over a longer course in significantly tougher conditions. 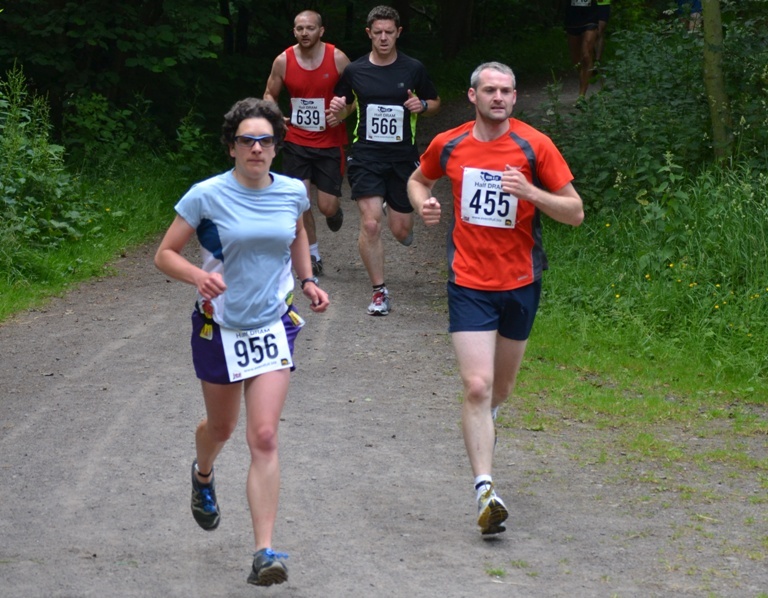 The next week I decided at the last minute to enter a local SMBO (Scottish Mountain Bike Orienteering) score event in Mugdock Park, which is just on the outskirts of Glasgow. I got a lift over very early in the morning. Too early, considering I was out late watching an Italian film the night before. This event was very low key, with only three female solo competitors. I was pretty relaxed about the race which is unusual for me. And the result was just a second place – I wasn’t concentrating or working hard enough and one of the other girls was strong! The map was challenging, with intricate detail I’m not used to for mountain bike navigation. There were also many controls seemingly placed ‘on a tree, in a wood’. They weren’t joking at the start when they said the descriptions would give you a ‘clue’ as to the location …! Never mind, I had a good time riding my bike in new places out in the sunshine and won a few things from Alpine Bikes. I then took the opportunity to meet up with a friend in Glasgow and spend a lazy day eating noodles, chatting, sleeping and eating brunch. 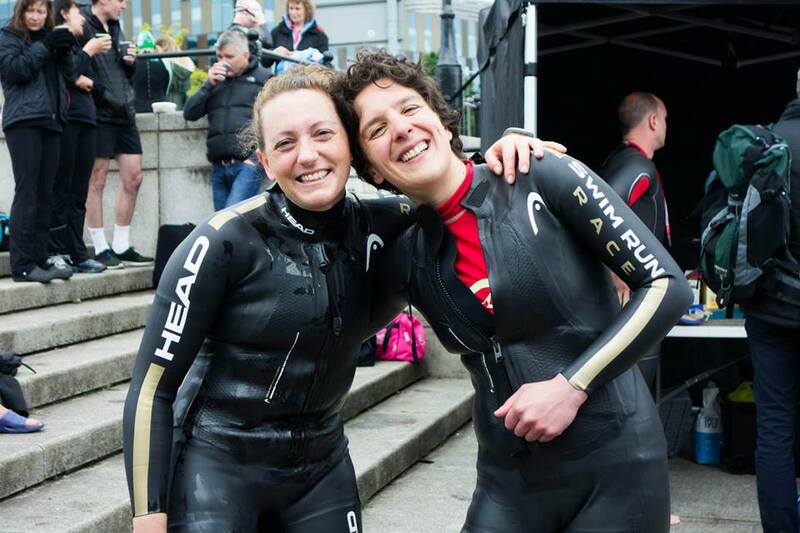 Next up … a sprint triathlon in Kendal. No slacking on this one. Despite it not being a target race, it’s important for me as my only actual triathlon before the Slateman in a month’s time. I want to get everything right and have my own goals in mind! I’ve been very quiet since the Slateman triathlon as I’ve had my head down doing final training for the Celtman. It’s now only one week to go! This race won’t be the longest I’ve ever done. I expect it to take about 18 hours, though I’m still finding it hard to judge my bike pace. This compares to four 24 hour races I’ve done in the past. The difference with this one is the fixed distances and strict time cutoffs! I won’t be able to rest between laps or miss a few checkpoints and still be able to finish. The race is also unusual for me because I’ve invested more time and effort into it than anything else I’ve done before. I’m not sure why – except that my Ironman-finisher friends got me scared way back in November and made me feel like I had better put in some really hard work! It’s been fun though. I‘ve got used to swimming (rather than just squawking and playing!) in waves and finding out what it’s like to swim to a distant point that never appears to get any closer. On my final big training weekend I celebrated the Queen’s jubilee by making the most of the amazing place I live. 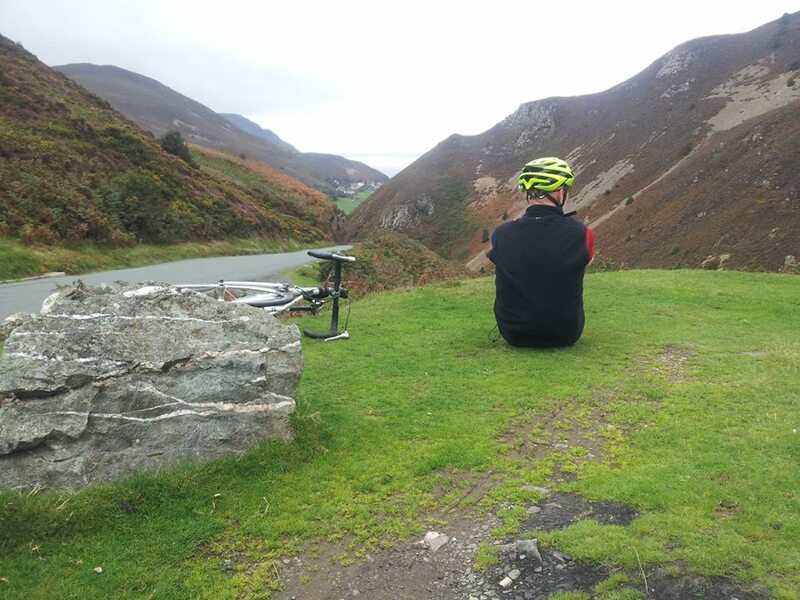 I did a delightful 165km loop over the Lammermuirs. This is the view up Redstone Rigg, which I have only discovered this summer. And later I persuaded Chris (a car-owner!) to take me further north to some inviting Munros. I did 5 of the summits on the Ben Lawers ridge. I set off a bit scared about tackling such big looking mountains by myself in insubstantial running gear and carrying my small pack containing the mandatory race kit list. The Ben Lawers ridge – 5 Munros! It was much colder up at the top than down at the bottom and I was glad of my woolly hat and gloves, even in June ;-). 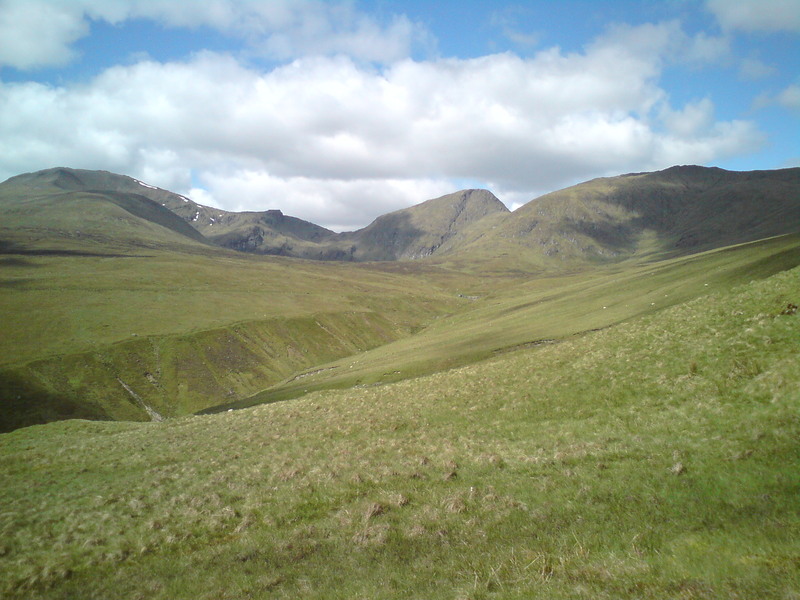 The route I took was from MunroMagic and was a good one – not too many crowds except for the stretch between Ben Lawers itself and Beinn Ghlas. One of the best feelings about this day was being fit enough to enjoy such an adventure so easily. After helping some girls with a photo, I took off down a tussocky grassy spur with no path. Even with my poles I managed to nearly twist my ankles several times before making it to the bottom in time for a quick dip in Loch Tay to cool off! Several stiff days followed, so I am under no illusions as to how long my legs might hurt post-race! And now I am into ‘tapering’. I was warned I might feel rubbish in these two weeks and it’s true. I get paranoid when I meet an ill person, I freak out every time a car drives too close to me, I imagine I am coming down with ‘something’ every other day and my body is throwing in aches and pains pretty much everywhere! I am trying to stay calm and get plenty of sleep. This weekend I had fun swimming up at Thriepmuir Reservoir in the rain with some fellow racers and then getting totally lost running on Arthur’s Seat. People who know Arthur’s Seat will realise this was a bit ridiculous – but the fog was right down, I couldn’t see any of the usual landmarks and I lost all sense of direction! Luckily in the race, Kate will look after me on the mountain should a similar situation arise :D.
And so with 5 days to go I am into final preparations: buying my favourite foods, making lists and waiting expectantly for my supporters to arrive. Hurrah!